Discussion in 'E-Sports Hockey League - Xbox' started by Tris10, Apr 7, 2019. 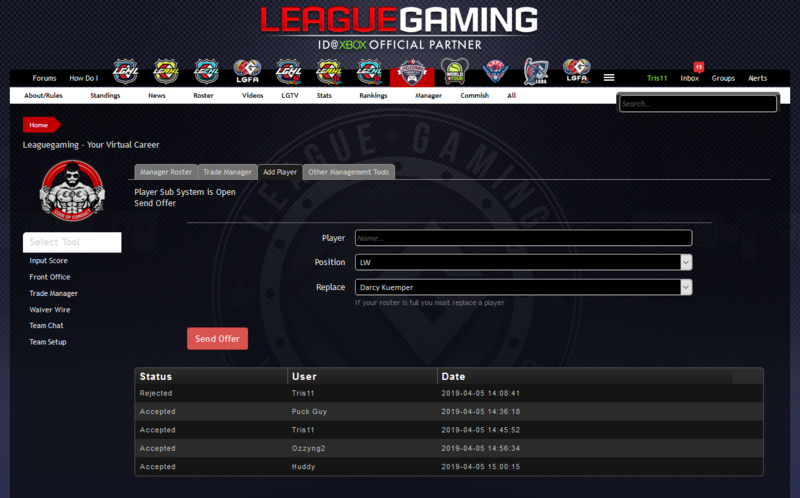 We've fully moved the "roster sub" system to be in the ESHL > Manager > Front Office. Do not play anyone in an ESHL game UNLESS they appear on your ESHL > Roster Page. To do a roster sub, simple goto your front office and to the "Add Player" tab. The system knows the roster limit is 9 players, so if you are at 9 you must select a player to drop. Remember the system will not let you pick up anyone who's been in the event before, also once you drop someone, they can not play for you or anyone else during the event.